Now one major factor I’m looking for when shopping for a mouse would be ergonomics. This is probably a no-brainer to you guys. We all don’t want to end up eventually with RSI or Carpal Tunnel syndrome. Mice that are shaped in a way that will hurt in the long run tends to be shunned, for good measure. 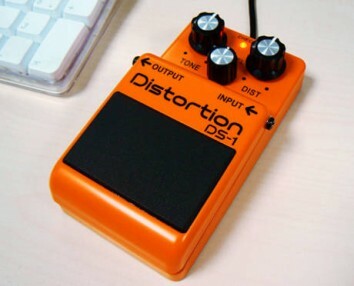 So how come I want Boss’s DS-1 distortion pedal mouse so badly? I mean, just look at it. Grab a huge rectangular box (or if you have a guitar pedal lying around), and just use it like it’s an actual mouse. It’s a pain, isn’t it? And judging from the fact that the DS-1 pedal mouse looks like an accurate replica of the real thing, the ergonomics won’t be too different. But dammit, it’s just too cool to not own. I won’t be able to use Photoshop or play StarCraft with it, but I can probably use it for short periods of time so I can show it off to some friends. Size- and layout-wise, it’s almost identical to a DS-1. There’s the usual three knobs up top and a glowing red LED when it’s plugged-in (Mick was most upset there wasn’t a blue LED option for Keeley mod fans) – there’s even two screws on the side for the ‘battery compartment’. The main differences? Well, mercifully it’s a bit thinner than a proper DS-1, though only by a centimetre or so, but its footprint is identical, and there are no input and output jacks (there’s a mouse-wheel where the output should be). The clickable knob/buttons are a bit odd too – they feel slightly unsteady, more like joysticks than buttons. However the side-mounted mouse-wheel is actually really well positioned. Well, that settles it. It’s probably one of the suckiest mice ever in terms of ergonomics, but I’ll be damned if some silly thing like possible RSI stops me. Sadly, a great-looking mouse like this won’t last for long. It was actually sold out of BOSS’s website pretty quickly after it was launched. It’s a shame. I’d gladly pay for the pretty steep £29.99 without thinking twice.